The Great Coat And Tie Experiment: Tan Tuesday? I guess so. The tan camel hair again today. I've got a couple more sportcoats that ought to be ready any day now. They're both solids too -- one gray and one brownish color. Hopefully those will make their first appearance on Thursday and Friday. I've noticed a few places on the net that say it's OK, in fact fashionable, to wear your pinstripe suit coat with trousers other than those that complete the suit. Maybe I'll try that someday. One thing is sure, though. I need a little more color or variety or pattern or something in my coats. The dress shirt is a French blue, non-iron, broadcloth point collar. I think I'm going to stop buying the colored non-irons. The collar points tend to wear out first and show white while the rest of the shirt is still perfectly fine. I don't have that problem with my other, regular, colored dress shirts. 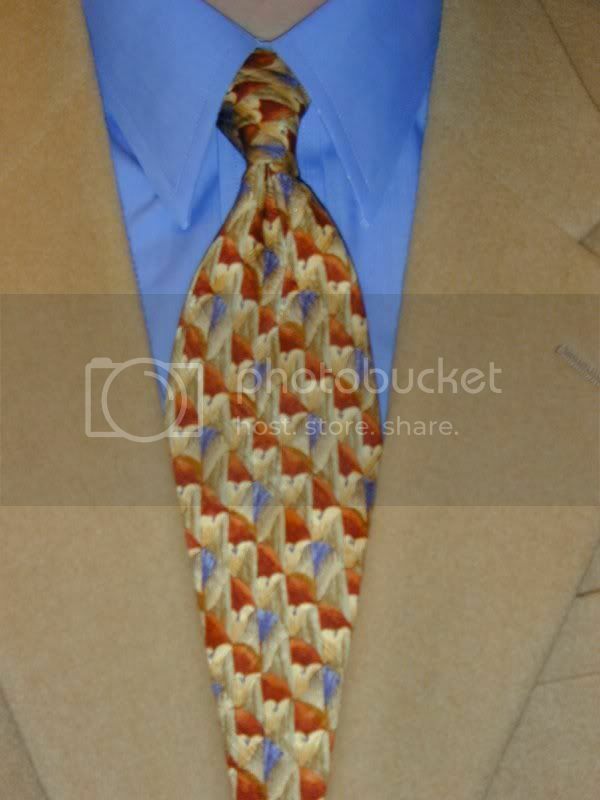 The necktie is a Talbott Best of Class. Another Ebay purchase. It's got a somewhat tan background (if there really is a background color on this one) with different shades of brown and blue throughout. Four-in-hand knot again today. Yes, I guess it is boring and I should try some of those other knots that I posted yesterday.